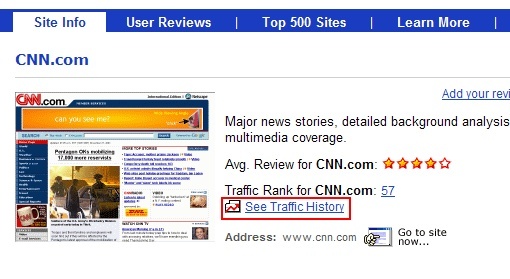 What does the "Traffic History" show? "Traffic History" provides an interesting insight into upward or downward "daily traffic rank trend" experienced by the website. This is compiled during the most recent one to three month period of traffic activity. You can select the period and size of the chart in the top corners. The “Compare to…” search field dynamically generates a graph comparing traffic rank activity of the site being visited to another site that you specify.